Science at the Rodeo: First female judge, tagged fish returns, and where’s the spot? DISL Spotlight: Intern to Ph.D.
What could cause the Mississippi Bight to become hypoxic? 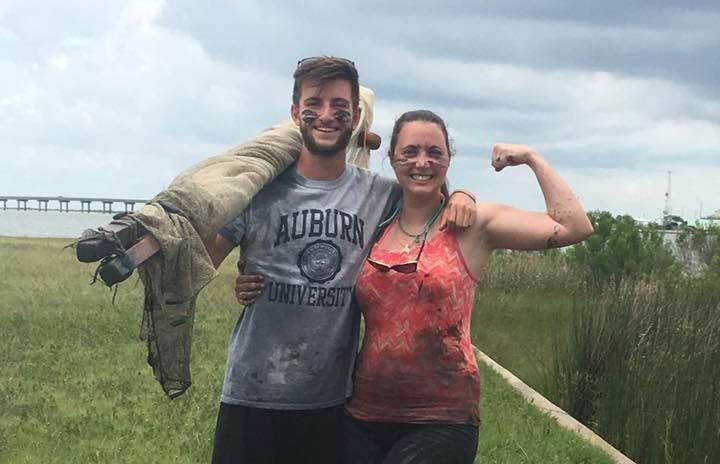 Katie Raines and Nick Lockert celebrate a successful seining the airport marsh with Dr. Paul Gier's marine Behavioral Ecology course. Undergraduate and graduate students from 16 Marine Sciences Environmental Consortium schools spent their summer getting muddy in the marsh, trekking through wetlands, counting crabs in oysters, learning why marine animals behave the way they do, and much more this past summer at the Dauphin Island Sea Lab. The students, through enrollment at their home institution, earned up to 16 hours of summer credit through DISL's University Programs. Each course takes students outside the classroom and into the field for a chance to put what they learn in lecture into action. "I learned more than I ever thought there was to know about wetlands," Rae Donnenwirth, a graduate student from the University of Montevallo, shared. "Dr. Stanton was an enthusiastic professor, who was not only able to translate his vast knowledge on wetlands through his passion for them, but also transmitted that excitement into us as students as well." Dr. Lee Stanton, a University of West Alabama professor, is one of more than a half dozen visiting faculty members who teach summer programs at the DISL alongside permanent faculty.Other visiting faculty members include University of Alabama Birmingham's Drs. Thane Wibbles and Christianne Strang,; University of Mobile's Dr. Lesley Baggett; University of Tennessee at Martin's Dr. Michael Gibson; University of South Alabama's Dr. Jack O'Brien; Mississippi State's Dr. Mark Woodrey; Huntingdon College's Dr. Paul Gier; and Dr. Jennifer Lewis with the Tropical Dolphin Research Foundation. 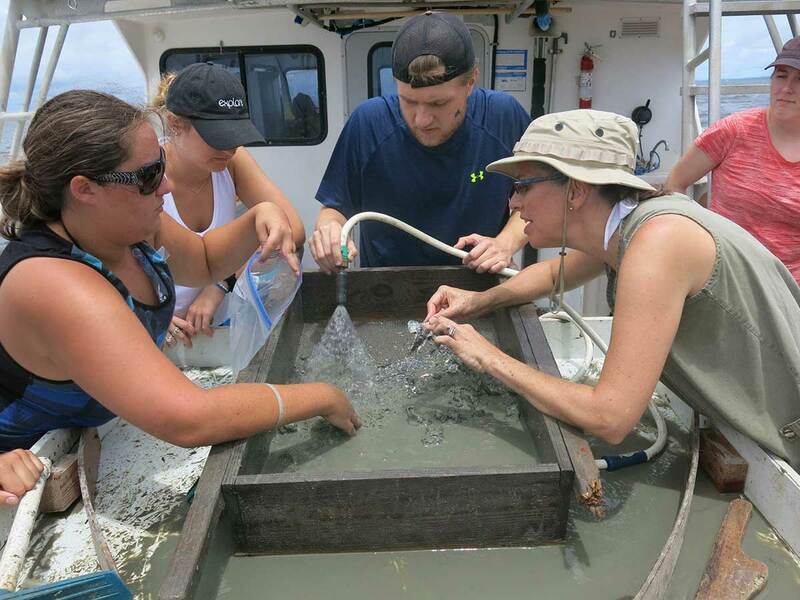 Dr. Ruth Carmichael teaches aboard the R/V Alabama Discovery during her Marine Invertebrate Zoology course. "There are no 'canned' labs, so each day really did surprise us," Dr. Gier shared of his Marine Behavioral Ecology class. "The students often created their own experiments either in tanks or investigating wild populations of fish or crustaceans. We followed up on interesting behaviors we saw in the wild, and discussed ways to test hypotheses and learned new techniques in data analysis. We snorkeled in clear water surrounded by fish, we studied fiddler crab behavior in the aftermath of a tropical storm, and we marked and measured blue crabs without anyone losing a finger." Taylor Lewis, a sophomore from Spring Hill College, loved getting into the field right away with Dr. Wibbles' Conservation of Marine Turtles course. "I was honestly expecting just pure lectures for the first week of classes," Lewis said. "It was great to get hands on experience, since I ant to extensively study and research this area. We visited the Mote Marine Lab, The Turtle Hospital, and the Loggerhead Marine life Center. It was great traveling in such a small group because we got to ask the researchers a lot of questions and get high quality answers. Going on this trip also opened up a lot of internship opportunities not only for me, but all DISL students." Lewis, like a number of her classmates during the 2017 summer programs classmates, will be back for round two in 2018. To learn more about typical courses offered during the summer session, and how to register, go to disl.org/univ-prog.